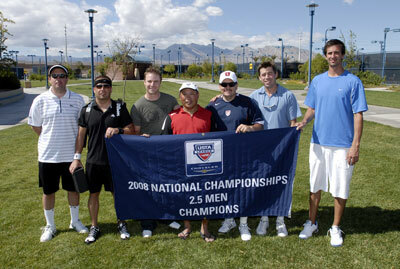 LAS VEGAS (Oct. 5, 2008) - The men’s team from Salt Lake City, representing the USTA Intermountain Section, captured the national title at the USTA League presented by Chrysler 2.5 Adult National Championships held at the Amanda & Stacy Darling Tennis Center in Las Vegas. The Salt Lake City team defeated a team from Gurabo, P.R., 2-1, in the Championship match. Earlier in the day, the Salt Lake City team defeated a team from Tyler, Texas, 2-1, in the semifinals. They advanced this far by winning their round-robin flight contested Friday and Saturday. The team is captained by Carey Durrand Johnson and features Cameron Lee Beckham, Clinton Arnell, Mauricio Serafin Cuellar, Camron Comish and Hal H. Crimmel. The top four teams in order of finish are: Salt Lake City (Intermountain), Gurabo (Caribbean), Seattle (Pacific Northwest) and Tyler (Texas).